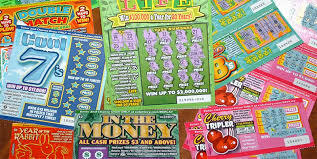 I persist in the occasional practice of buying lottery or scratch off lotto tickets despite regular feedback from my statistically savvy spouse that I have a snowball’s chance in Hell of ever winning. 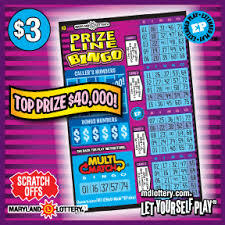 In other words, you are never going to win, and this is a waste of money. Anyhoo, back to the subject of BINGO. I recently bought 5 Lotto tickets. 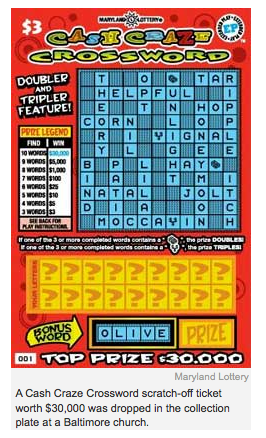 Upon scratching off the first ticket, I was able to ascertain that this card required more than the usual determination of whether I got a winning, $5 -$5 -$5 combo or, better yet, the lucky $50,000-$50,000-$50,000 combo, which I know I’m gonna get really soon since the odds are in my favor. This matching three numbers type of computational activity is already stretching the outer limits of my most advanced mathematical capabilities. This card had actual numbers, in COLUMNS, that required CALCULATIONS, plus additional WEIGHTING FACTORS! 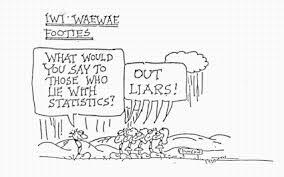 Due to religious and ethical considerations, as I have explained before, I do not partake in such mathematical misadventures, and leave all of this type of questionable activity solely to my savant spouse. So, I left the five tickets on his desk after he went to bed, with a nice post-it-note, asking him to figure out whether or not I (we of course) had won. I didn’t have to spend 45 minutes figuring this out now, did I? He really does take all the fun out of gambling though. 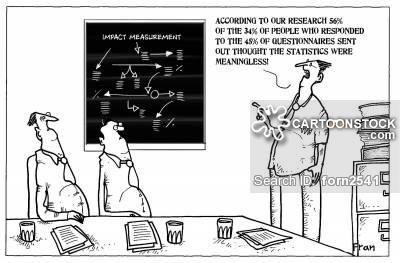 I must admit though, living all these years with a math whiz, has really improved my probabilistic abilities. Which gives me a great idea……..
Let’s form a pool! 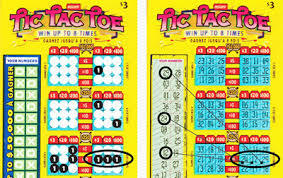 If we all go in together and buy 500 tickets this will really improve our odds of winning!!! Tech Marvels & the TV Tray. Some of you may recall, I previously posted prior segments of this 1950’s series, ending with photos from Betty Crocker’s house and barn and anything else I found there to photograph (See October 11 post under Tech Marvels.). My mother Eleonore came with me on this adventure , as we browsed at the antique barn and acted like undercover paparazzi, snapping shots incognito for your pleasure and edification. This was so exciting. I couldn’t stand it. 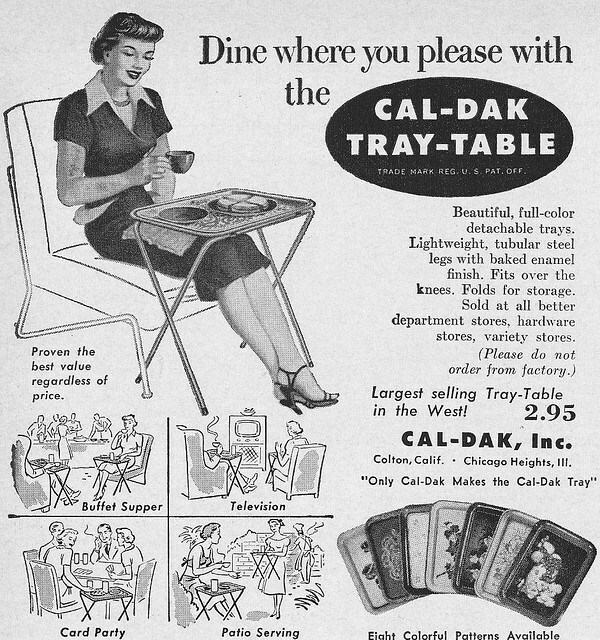 Today, part four ( for those who are numerically challenged, like me) we will be discussing that integral part of the 1950’s-60’s life, The TV Tray. 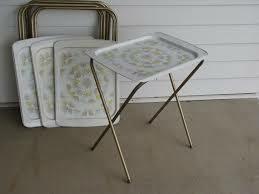 TV trays were of course made to eat TV dinners on in the 1950’s & 60’s. 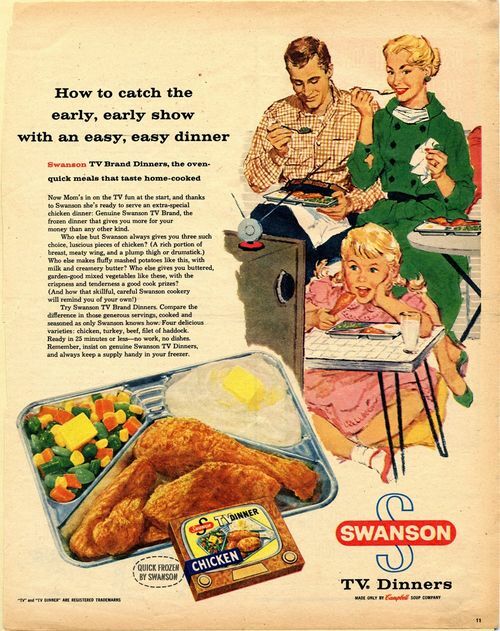 TV dinners started out rather small, so the original TV Trays were rather small too. Everything in the 1950’s was small, bathrooms, closets, me. 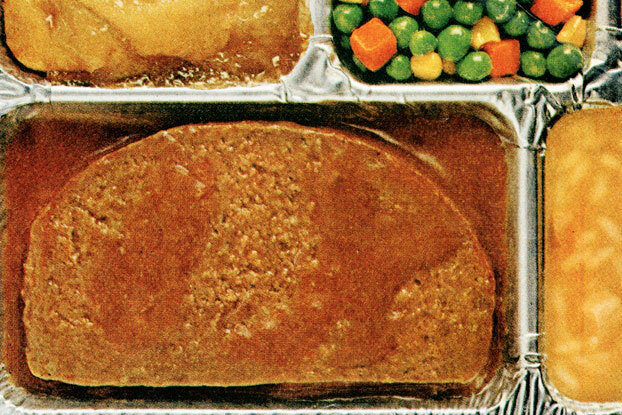 Swanson sold millions of these babies, so they ramped up production and diversified to things like my favorite as a child, “Salisbury Steak.” See example. YUM! So truth be told, millions of kids like me were sitting in front of tv screens, numbing our brains in the 50’s/60’s watching TV. The computer now at least requires some type of cerebral activity in users. 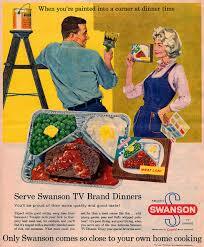 By the time the 1970’s rolled around, TV dinner’s technologically advanced one more time. 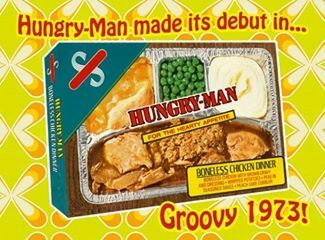 “Hungry Man” larger TV dinners were developed. This was in response to the men’s movement (or something). Anyways, ads came out with a song & jingle, whose lyrics were, “How do you handle a hungry man? The manhandlers.” I kid you not! It was sung in basso profundo by lumberjacks or something. 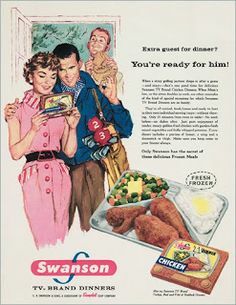 Anyhoo, “The Man Handlers,” were an innovation by Swanson again (The Apple of their time) to handle the big appetites of big men, who were obviously not happy with their TV dinners and must have been bitching, I mean complaining about them at home. I ate them so I can attest to the fact they consisted of an additional two ounces of something approximating chicken noodle soup, a delectable three ounces of “fruit” (I use the term loosely) cobbler, and an extra couple of ounces of something resembling vegetables. I am exhausted now by all this extensive history, I am sure you are too, and I am too tired to make dinner. Where are the damn TV trays? 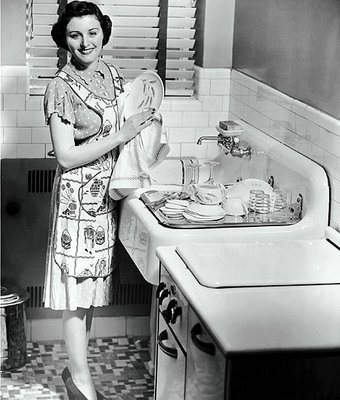 How Come one Woman is so Happy Washing Dishes, and the Other Isn’t? Can You Guess? 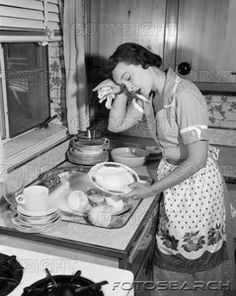 Well, duh, the poor tired woman doesn’t even have a dish drainer! Sheesch! I got to thinking about 1950’s housewives and decided to do a post about my grandmother Rose (who I called Nana). She was really a 1930’s, 40’s, 50’s, 60’s, and 70’s housewife. She took it seriously, did it well, and I respected her. She died in 1987 in her mid-eighties. 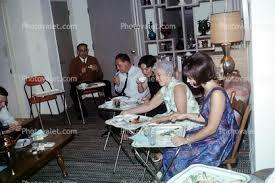 She was the consummate housewife and cook. 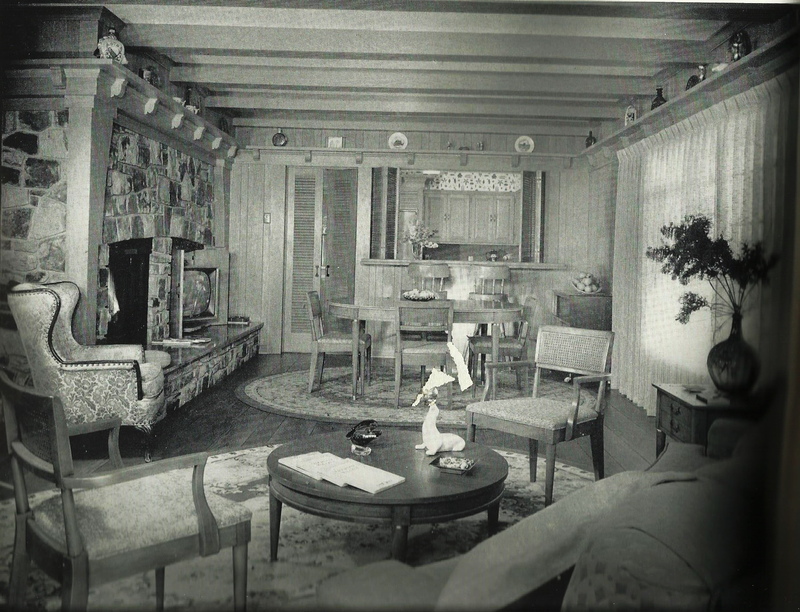 Here is a photo I saved from Architectural Digest taken in the early 1950’s of her kitchen and family dining area. Look pretty 1950’s to you? Ozzie and Harriet could walk right in the door. (If you are too young….gooogle it). I still have my grandmother’s handmade aprons and can attest to the fact that they were worn always in the kitchen. 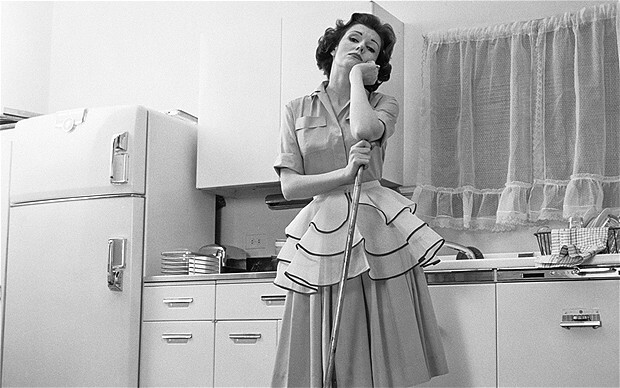 She had everyday aprons and fancy, for party-aprons, that were made out of taffeta. I kid you not! I swear this lady stole Nana’s taffeta apron and I want it back! I would SO wear it for parties. 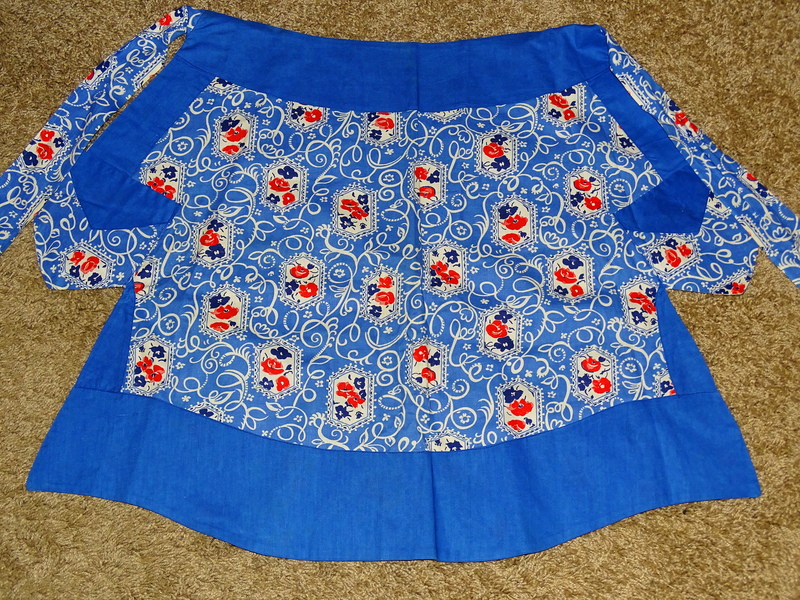 Here is one of her everyday aprons that I kept. This is a recipe from Nana. She would make it for family dinners and picnics. 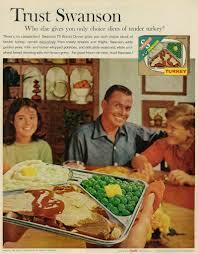 I especially remember eating it on a picnic in Borrego Springs when I was a child, around fifty years ago! My grandmother was of Polish and German descent and she was an incredible cook. This is a sticky fingers chicken dish, hence it’s name! I haven’t seen a recipe like it and it is still a hit in my family. Shake chicken pieces in flour in large zip lock bag. Brown in bacon fat until well browned. Remove chicken from pan. Add onion and celery and sauté until soft and slightly brown scrapping the brown bits into the veggies. Add two rices to bottom of a large roasting pan with seasoning packet. Stir in ½ cup of hot broth. Place chicken on top of rice. Season with salt, pepper, parsley, thyme, sage, and nutmeg. Pour remaining broth and vermouth over herbs, seasoning, and chicken. Cover pan tightly with lid or foil. Bake for 1 hour at 350-degree oven. Serve with your choice of vegetables. And, don’t forget your apron! 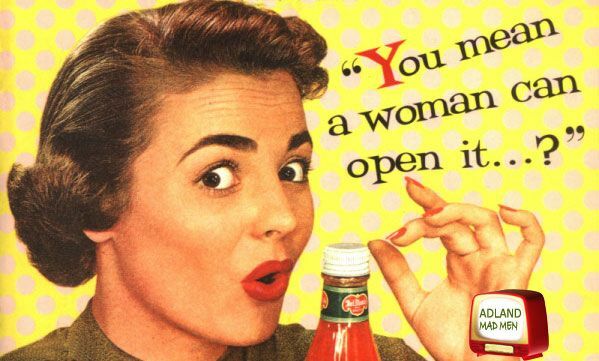 I’ll leave you with a 50’s ad if you need a brush up on the era. I love this 50’s theme so my next post is going to be, “I Live Near Betty’s Crocker’s House,” which I do, and I will prove in my next post. So stay tuned!